JLowe2018 wrote: Not sure if I'm posting this image correctly, but for reference, buildings 3 and 4 are the two buildings to the right of the two recently constructed buildings in the middle of the campus. Phase 3&4 will be somewhat less highly designed than 1&2. Less "iconic," more high quality office space, think more like Continuous Campus. I like the current new buildings. Take away the parking lots and they are pretty cool looking IMO. They would look great in an urban location near downtown, hospital hill etc. I thought the next phase was going to be nearly a mirror image of the first two buildings. I know. Not a fan of the surface parking lots either. Structured parking is expensive to build/maintain. There have been expenses with the garage at Riverport Campus and as a result Cerner leadership won't sign off on any structured parking. Found these renderings. They are pretty spot on as far as what was built so far. GRID wrote: Found these renderings. They are pretty spot on as far as what was built so far. Looks to be a stereotypical suburban office park totaling about $70 Million in investment? Pretty stereotypical for cities without any real push for density. 4 low rise towers. Sea of parking. Am I close? Two constructions cranes are up south of the current building and looks like they are moving dirt at a few other locations. Got a Hardee's,Big Mamma's and so,on new near by. mgsports wrote: Got a Hardee's,Big Mamma's and so,on new near by. ...a universal measure of successful city building. I have not been yet, but I just had a recommendation from a guy of Filipino background for Manila Bay Ihaw Ihaw across from the Home Depot. I'm not big on buffets, but I don't think you have to get food from the buffet. It is the only Filipino restaurant I know of in the city. I may try to get takeout there sometime in the near future as it would be great to have this type of cuisine around. They’re building and going vertical w/ that pavilion thing between the taller buildings. Been kind of cool to watch from my school the past few months. Anyone read and can summarize where the new larger than life subdivision is being developed as per the article in KCBJ? I can’t imagine it’s in the Hickman School District. atticus23 wrote: Anyone read and can summarize where the new larger than life subdivision is being developed as per the article in KCBJ? I can’t imagine it’s in the Hickman School District. Forest Tyson Jr., owner of Kansas City construction firm Tycon Co. LLC, is seeking development plan approval for the 141-lot Tyson Summit single-family project northeast of 55th Street and I-435. 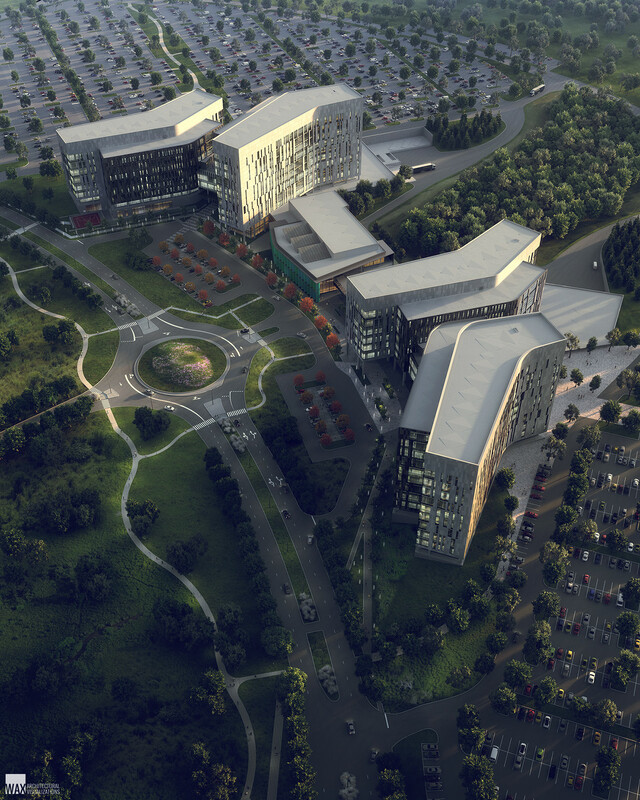 Tyson's proposal for the 48-acre residential site also requires planning approval for the project and will be seeking a Chapter 353 property tax abatement to help "give people more house for the money." The Parcel Viewer has a school district layer, makes it really easy to answer this kind of question. That's firmly in Raytown schools. The property abuts Eastwood Hills Elementary. This development is closer to Independence, Center and KC schools in terms of travel distance than Hickman Mills. Interesting and thanks for info guys! One of the biggest office construction projects in the entire Midwest, if not the country and it gets pretty much zero attention here or anywhere else. That alone should say something about just how bad of a design this really is and how this walled off private single use office park will have almost no impact on South KC. If even half of this proposed campus were to go downtown, that would be like eight Strata towers. Not to mention how bad this has screwed over the Hickman Mills SD. They are broke. Cerner pays next to nothing.